More than half of college students may suffer from malnutrition due to "food insecurity," mainly because they can’t afford the costs of healthy foods. Photo courtesy of Shutterstock.com. 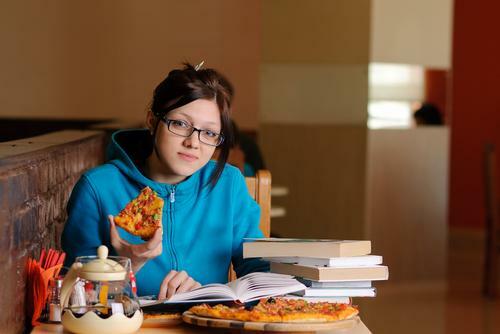 A fear for many college students who transition from high school to university life may include gaining the dreaded “Freshman 15” through too much consumption of unhealthy foods. However, a recent study published in the Journal of Nutrition Education and Behavior found over half of college students had high levels of "food insecurity," meaning they had limited or uncertain availability to healthy foods due to high costs, leading to a higher risk of malnutrition. High food costs, limited income, and poor food support systems are contributing risk factors of food insecurity. In the United States, 15.9 million children under 18 live in this condition, unable to consistently access nutritious and adequate amounts of healthy foods, according to the latest statistics by the U.S. Department of Agriculture (USDA). This means some kids do not always know where they will find their next meal. Food insecurities may lead to a series of problems related to academics, physical health, and emotions. In children, limited or no access to healthy foods has hindered their ability to function normally and participate fully in school and other activities. Michigan State University says children with food insecurities are more likely to require hospitalization, a higher risk of chronic illnesses — such as anemia and asthma — oral health problems, and a poor physical quality of life. Behavioral issues including fighting, hyperactivity, aggression, anxiety, mood swings, and bullying may also be present in food insecure children. A team of researchers from Oregon State University and Oregon’s Benton County Health Department, have delved into food insecurity among an often neglected population from the conversation. Doris Cancel-Tirado and Leticia Vazquez with Western Oregon University, co-authors of the study, and their team examined the prevalence and risk factors for food insecurity among 354 college students aged between 19 to 24-years-old attending the university. The USDA Household Food Security Survey Module: Six-Item Short Form was used to measure food security status in a household, or in this case, a college campus. Socioeconomic and demographic variables were also taken into account. The findings revealed 59 percent of college students had food insecurities, or some concerns over accessing healthy food options. By comparison, the percentage of all households in the U.S. with these similar concerns is 14.9 percent, the researchers found. The alarmingly high levels of food insecurities among college students can be attributed to several factors. In the past three decades, the cost of higher education has surpassed inflation, the cost of living, and medical expenses. This is also followed by a combination of more low-income and first-generation students attending college, and the changing demographic trends making this a more significant issue than it was in the past, according to the OSU news release. Before, students who lived on a “tight” budget believed food insecurity was part of the college experience, a transitory thing, but now the rising costs of tuition are affecting more people. “…many of these students who are coming from low-income families and attending college for the first time, this may be a continuation of food insecurity they’ve known before. It becomes a way of life, and they don’t have as many resources to help them out,” said Megan Patton-Lopez, lead author of the study with Oregon’s Benton County Health Department. The students who reported food insecurity also reported working an average of 18 hours a week — some as high as 42 — but the financial demands they were encountered with offset the effects of having a better income that could facilitate the costs of healthy foods. These findings dismiss using employment as the sole solution to this great health concern affecting more than half of the college population. The inaccessibility of healthy foods leads to the consumption of unhealthy foods, and therefore, a lack of vital vitamins and minerals that help sustain a person's health. Food insecurities contribute to depression, stress, trouble learning in the classroom, and poor health. In a similar study published in the Journal of Nutrition, adults with chronic health problems such as back problems, arthritis, diabetes, heart disease, and mental illness, were more likely than those without those ailments to live in food insecure households. The researchers believe two main reasons for these findings may be attributed to the additional cost of managing illness, which can lead people having less money to buy food, and dealing with chronic illness, which could limit people’s ability to manage with limited resources. These two studies provide new information for health professionals and policymakers to better facilitate the needs of people who may be susceptible to food insecurity. Employment alone has not proved to be helpful, which means more initiative and research must be done to better meet the demands of all groups, including the young crowd of college students. “One thing that’s clear is that colleges and universities need to be having this conversation and learning more about the issues their students may be facing,” said David Lopez-Cevallos, a researcher of the study. According to the American College Health Association, the percentage of overweight and American college students has risen from 27.4 percent in fall 2006 to 29.2 percent in fall 2011. Unhealthy eating habits, sedentary lifestyles, and food insecurities have contributed to this high statistic. Colleges and universities along with health officials should make greater efforts in addressing the obesity epidemic and its detrimental health effects. Cancel-Tirado DI, Lopez-Cevallos DF, Patton-Lopez MM, and Vazquez L. Prevalence and correlates of food insecurity among students attending a midsize rural university in Oregon. Journal of Nutrition Education and Behavior. 2014. McInyre L, McLaren L, Mitchell A, and Tarasuk V. Chronic Physical and Mental Health Conditions among Adults May Increase Vulnerability to Household Food Insecurity. Journal of Nutrition. 2013.